After School Midnights tells the story of three children who run afoul of a sentient human anatomy model in a newly built school. The model then proceeds to "kidnap" the children in the middle of the night to extract his "vengeance"... with hilarious results. We were fortunate and privileged enough that the director of the movie, Hitoshi Takekiyo, found the time in his busy schedule to fly all the way over here to Singapore for the preview. I never would have expected to be able to meet Takekiyo-san when I first got the email invitation from the nice people over at AFA. It is a great honor, really. Before the screening, there was an interview with Takekiyo-san about the movie, during which he gave some tidbits about how the movie was created and showed some bloopers. As you might expect from a comedy movie, there were lots of funny things that took place behind the scenes. The first thing that you notice about After School Midnighters is the animation. Takekiyo-san has revealed to us that the movie was filmed almost in it entirety using motion capture, and it shows. The movements of the principle characters are fluid and life-like, beautifully so. If you remember, they also used motion capture to bring Gollum from the Lord of The Rings to life, so its is actually a great way to do realistic CGs. Facial expressions are done frame by frame with software, of course. One thing to note, however. While being pretty enough to look at, the animation falls behind the works of ufotable or Kyoto Animations. But considering that this is actually a small studio, it is acceptable. In fact, it is because that it is a small studio with barely a name behind it that we can appreciate the works that Takekiyo-san has produced. The movie packs quite an impressive cast. There's Haruka Tomatsu (Sword Art Online), Minako Kotobuki ( K-ON!) and Kouichi Yamadera, among others. Sound is good too, and always suits the current scene. Essentially, the story itself is pretty simple. Takekiyo-san himself said that there wasn't any deep hidden meaning behind the story, and that is true. After School Midnighters is a call back to one of those traditional comedy movies, where you can go laugh and forget about everything. There really is nothing to think about - just let the laughs come naturally. 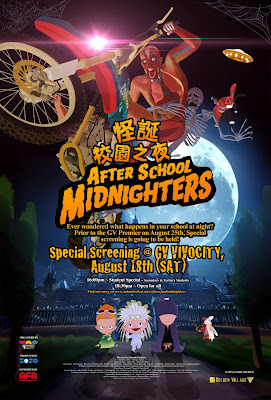 All in all, After School Midnighters is a enjoyable, fun-filled movie. If you have an hour or two to spare and want something to brighten your day, do consider giving it a try, only at Golden Village Cinemas. The movie opens to the public this Saturday, the 25th of August. ....I didn't have fun, through. It was fun. Total: 3 / 5 Stars. Check out also the post by AniCulture!